NASA’s Solar Dynamics Observatory (SDO) lifted off on February 11 from Cape Canaveral Air Force Station’s Launch Complex 41 on a first-of-a-kind mission to reveal the Sun’s inner workings in unprecedented detail. The most technologically advanced of NASA’s heliophysics spacecraft, SDO will take images of the Sun every 0.75 seconds and daily send back about 1.5 terabytes of data to Earth — the equivalent of streaming 380 full-length movies. The Sun’s dynamic processes affect everyone and everything on Earth. SDO will explore activity on the Sun that can disable satellites, cause power grid failures, and disrupt GPS communications. SDO also will provide a better understanding of the role the Sun plays in Earth’s atmospheric chemistry and climate. 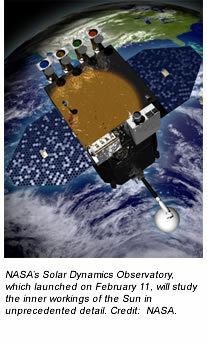 SDO is the crown jewel in a fleet of NASA missions to study our Sun. The mission is the cornerstone of a NASA science program called Living With A Star. This program will provide new understanding and information concerning the Sun and solar system that directly affect Earth, its inhabitants, and technology.